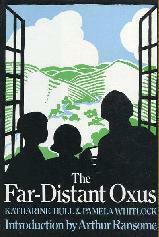 The Far-Distant Oxus was written by two teenage girls, Katharine Hull and Pamela Whitlock, as an homage to their favorite author, Arthur Ransome of Swallows and Amazons fame. Ransome enjoyed their book so much that he recommended it to his publisher, who did in fact put it into print with an introduction by Ransome. As do the Swallows and Amazons books, the plot follows a group of British schoolchildren on holiday. Bridget, Frances, and Anthony come to stay with Mr. and Mrs. Fradd at Exmoor, where they meet Peter and Jennifer, as well as the mysterious older boy, Maurice. These children form a team of explorers who christen the places they discover with titles from literature and have a variety of adventures right in their own backyard. The writing in this book is very inconsistent, as one would expect from the work of teenagers. Still, despite the overuse of certain phrases (these characters are forever “relapsing into silence”), the ridiculous over-romanticization of Maurice, and lack of much of an overarching plot, this book has much to offer young readers. There are some truly imaginative descriptions, including this one from the very first chapter: “From their high position they could look across the valley to a ridge of moor, and beyond that to another and another, stretching like a great purple eiderdown strewed with grey books.” There are real problems with plausible solutions and lively, realistic conversations amongst the characters. The book has flaws, but the reader becomes so wrapped up in its adventures that the problems become part of its charm.